An unique opportunity to ride with Ironman legend Jurgen Zack, a professional triathlete, from Bangkok to Phuket, Thailand, from 8 to 15 September, 2012. This special road bike tour is designed for cyclists that want to push themselves hard each day and at the same time have an opportunity to ride with a professional triathlete. Spending eight days with Zack they will have intimate time with him to get training tips and to hear some of Zack’s tales of racing against triathlete legends such as Mark Allen, Dave Scott and Greg Welch. Hailing from Germany, Zack holds eight worldwide Ironman titles, with eight top 10 finishes at the Ironman World Championship in Kona, Hawaii. He won the European Championship five times between 1989 and 1999. In 1999 he set the Ironman bike course record of 4:14:16 in Roth, Germany. Zack currently heads the Triathlon Academy. at Thanyapura Sports and Leisure Club in Phuket, Thailand. 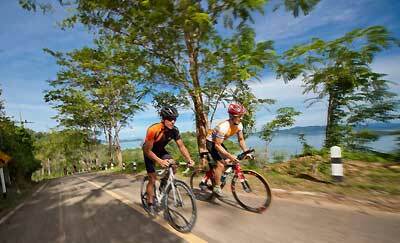 On the Bangkok to Phuket tour cyclists will ride 700 km in six cycling days. The group, which will be limited to 20 participants who have road riding experience, will ride along both the east and the west coast of Thailand and overnight at resorts along the way, with afternoons free to enjoy the beach or the pool. The tour ends at Nai Yang beach on the resort island of Phuket. Riders have the option to extend their stay to to go swimming and running training at Thanyapura Sports and Leisure Club with Zack. The Cycle with Ironman legend Jurgen Zack tour cost is US$1,950 and will be fully supported by air conditioned vehicles, with water, sports drinks and snacks provided during the ride and each participant will receive three complimentary Thai massages, a commemorative bike jersey and cap. Riders can bring their own bikes, or rent a Trek 2.1C from for US$200. To book your space contact Symbiosis Custom Travel now – remember, only 20 participants will be accepted.